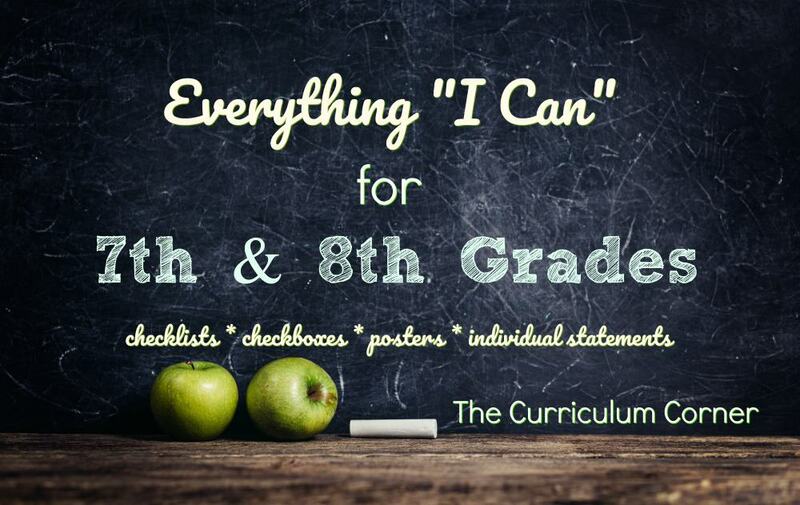 This collection of 7th Grade I Cans and 8th Grade I Cans is designed to provide teachers with an easier way of helping students understand the Common Core. We hope this makes it easier to access these resources. If you are interested in purchasing a commercial use license, please message us for details. As these files are so large, each has been provided in its own download. Click on the file link to download the items you need. Common Core Standards Checklists – We have created two versions of these teacher checklists. One is a PDF to print, keep in your plan book and write on each day to track when you address various standards throughout the school year. The second resource is a partially editable Excel spreadsheet that can be downloaded, typed in and saved on your computer. *NOTE – The titles and standards boxes in the Excel document have been locked. The only editable portions are the boxes to track the standards taught. CCSS “I Can” Statements Checklists – This is the same format as the document above, but it contains our “I Can” statements instead of the actual CCSS standards. “I Can” Student Checkboxes – These are ideal for including in student binders so students have something visual to help them track their own learning. You can check off progress with students and easily communicate with parents. Individual “I Can” Statement Posters – These were designed for teachers to post daily classroom objectives one at a time. We have kept the design simple so that you can print them on colored paper or back them with construction paper. Another idea to help with the organization of all of these posters is to put them on a binder ring so that they can easily be flipped through and displayed each day. 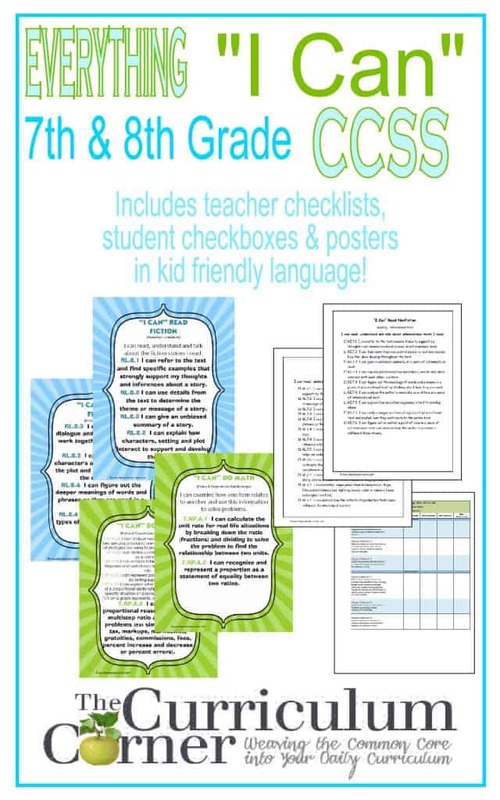 “I Can” Standards Posters – This resource includes all of the standards but they are spread out over a number of pages. Standards flow one to the next. Some teachers have chosen to make them into posters and highlight the day’s learning target with a clothespin or large arrow cut-out. What wonderful resources! Thank you so much for sharing! Love and as a middle school math teacher who also coaches 3 sports…..Thank you so much!!! These will be a big help for developing meta cognition. Thank you so much for sharing! Hi Melissa. Thanks for your question. At this point we don’t have plans to create “I Cans” or checklists for science for 7th and 8th grades. We are considering writing them to correlate to the NGSS for elementary, but don’t know when that will be. So very sorry! Thank you for the checklists for grade 8 CCSS for Language Arts & Math. They will be such a wonderful asset for our homeschooling portfolio review! It will also make planning lessons so much easier too! Do you have Standards Based Grading Rubrics that are based off of your “I Can” Statements or the Common Core Standards? Do you have the 7th and 8th grade checklists in Spanish? Thank YOU! Finding CCSS “I Can” statements or resources for the middle school levels has been frustrating until I found your site! WOW! Thank you! You just saved me so much time! Thank you soooo much for sharing this! This is such a great tool!!! Thank you so much! You make teaching fun again!! These are wonderful resources and I can’t thank you enough for allowing others to utilize them in our own classrooms! I’m a busy mom with three children and you have just helped me out immensely. Greatly appreciated! I love this. I will definitely use them in the classroom next year. Thank you sooooo much. I hate writing these every week, now I can just post! Love it! I am a first year teacher and this resource has saved me! Thank you so much!